Baba Ghanoush, say that three times. It’s such a fun word. The name has a delightful sound to it but what’s even better is the taste of this creamy eggplant dip. It’s rich, smokey, nutty, with a touch of garlic. It’s the type of appetizer dish you’ll want to dig into with a spoon. Eggplant, aubergine, or melanzana, as I know the vegetable, is the main ingredient of this dip. The dish is of Middle Eastern and Mediterranean origin, and we tasted it for the first time when our son took us to a restaurant that featured Middle Eastern and Greek cuisine. One bite was all it took. I think we heard angels singing on high. Believe me; we had to implement a lot of self-control, not to go back to the buffet and ladle the baba ghanoush onto our plate. Oh, and also grab the pile of warm flatbread that was next to the dip. For baba ghanoush, you only need five ingredients more: tahini ( a sesame paste), olive oil, fresh lemon, smoked paprika, and parsley. I don’t count kosher salt as an ingredient, even though it’s included because I figure you usually have that in your kitchen. 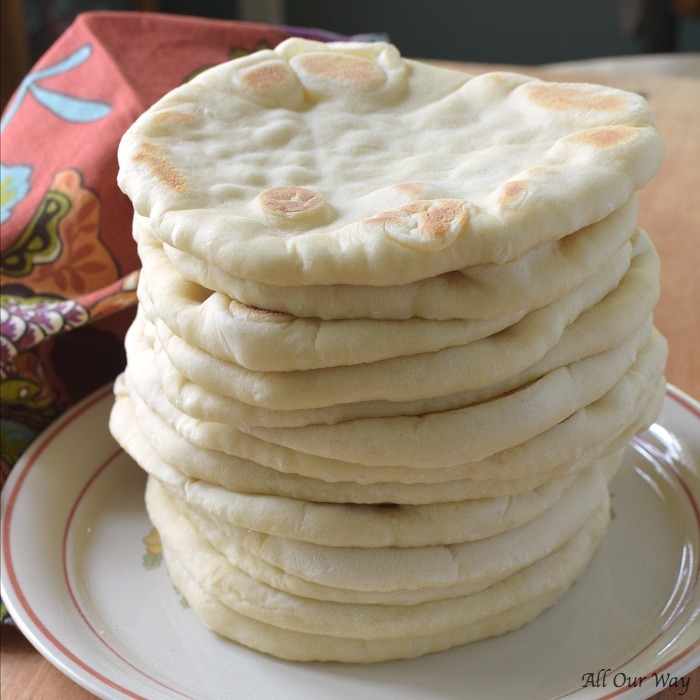 Those six ingredients in combination produce a magical substance that you’ll want to slather on a delicious piece of yeast bread like pocketless pitas. I want to fill you in on the secrets to making a superior eggplant dip. You roast the eggplants on a grill. You can check doneness by piercing either end of the globe with a skewer. If there’s resistance, just keep them on a little longer. When done, wrap the eggplant tightly in foil and let them rest for 15 minutes. Now, this is important ?, scoop the flesh from the skin and put the meat in a salad spinner. Yes! A salad spinner! Crank it gently. Spinning removes the additional moisture from the eggplant and concentrates the flavor. 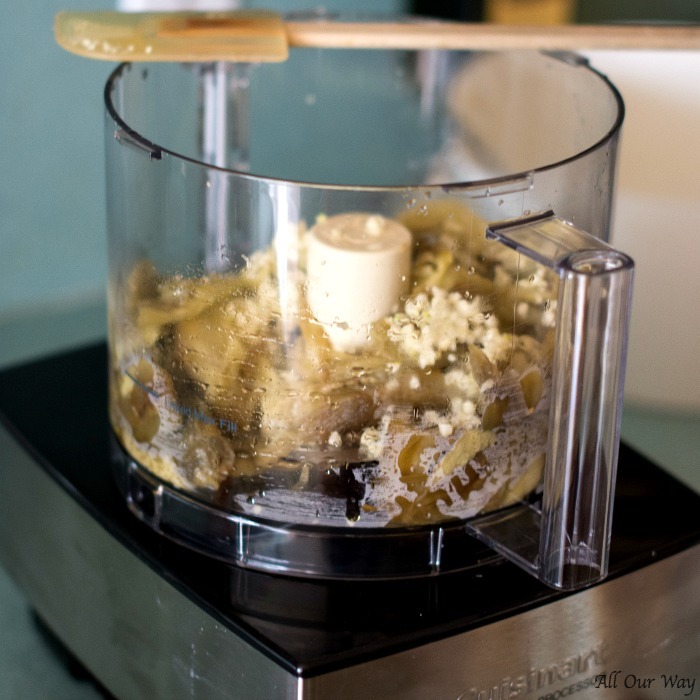 We like our dips creamy, so we put the eggplant, garlic, and lemon juice in our food processor. Pulse until it comes together into a smooth paste. We add the tahini and pulse again. Now, we turn on the processor and pour the olive oil in a thin, steady stream. Next, comes the parsley, salt, and smoked paprika and we mix that in by hand. Taste. Hmmm, does it need more lemon? More salt? Here is where you season to taste. Transfer to a serving bowl, drizzle with olive oil and serve with warm flatbread or veggies. Ecco!! You’ve made baba ghanoush!! Now, for the best part! Mangia!! Be sure you sign up for our newsletter we love sharing our recipes with you. Note: Recipes and content from ©2017 All Our Way are copyright protected. Please do not use content or recipe without prior written permission. If you want to share the information, please link to this post. Grazie! YES…this is my kind of dip. There was a time I never liked eggplant. Probably because my mom NEVER cooked it…not once. I have experimented with it over the years, and have grown to like it. This is my favourite way to enjoy it. Perfect for parties too. I agree, Gloria! And for the party let’s bring out the wine!! Yum! 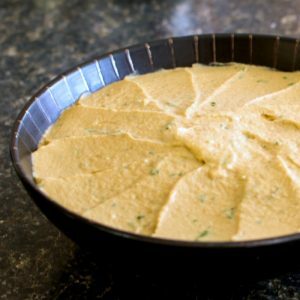 I have never tried making baba ghanoush and I don’t know what I am waiting for. It looks so easy and it is so good! babaganoush, babaganoush, babaganoush! I love it.. totally 🙂 and while I do experiments with hummus by adding roasted bell peppers or beetroot to it, I like baba gnash just the way it was originally intended. Just like your recipe! Hello, Ashima! We do like our dip. Our kids love it and I can’t wait for eggplant season to make some. I love this eggplant dip with celery, cucumber or peppers. Hi, Leo!! I’ll have to try it. I’m sure the grandsons could use more veggies in their diet. 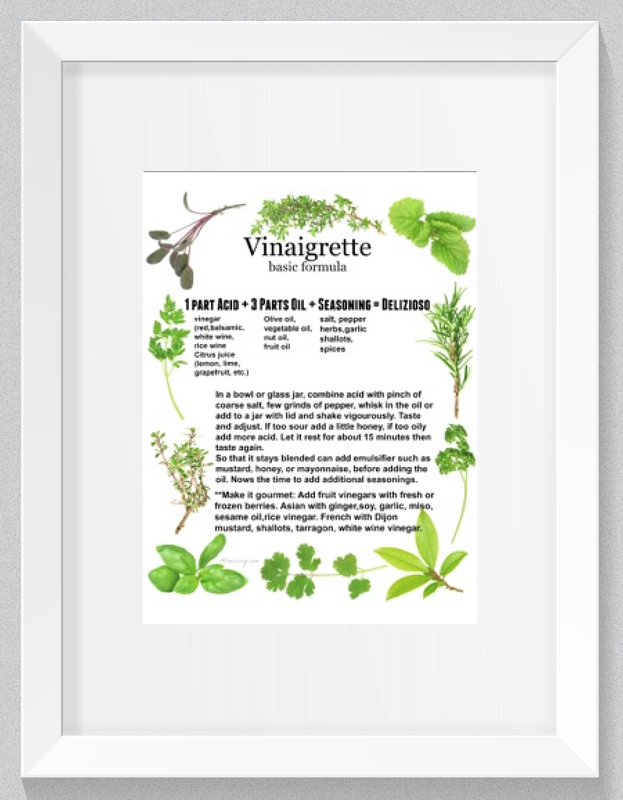 What a great way to coax them to eat more veggies. I do mine on the grill too! Great minds think alike… This is a fabulous recipe, and your baba ghanoush looks so creamy. I’d love some with fresh pita for lunch today! Hi, Tamara! I wish I had some now, too. 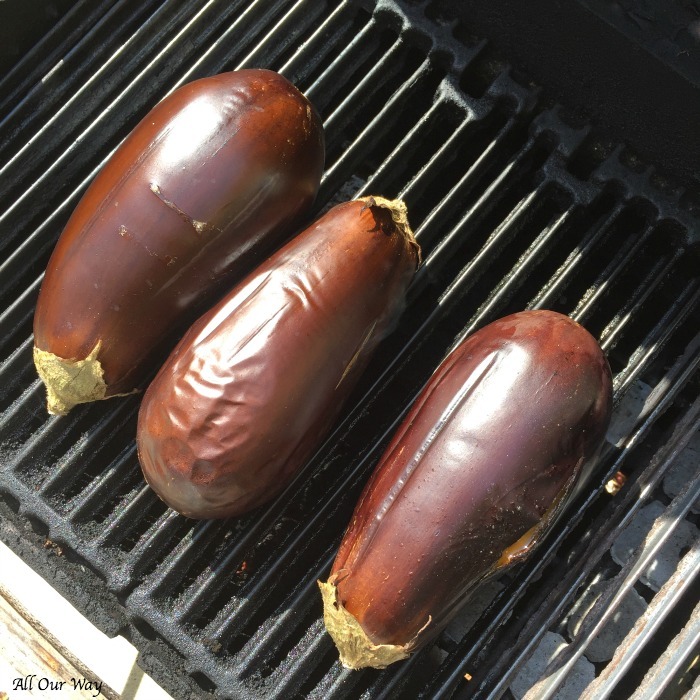 The grill makes the eggplant cook just right. Have a great weekend. Hi, Molly! I wish I could send it to you!! We are also huge fans of baba ghanoush now. Can’t wait to make it again. Hello, Sandhya! Eggplant is very versatile but this is so good, I have to admit I’ll be using lots of eggplant just for this recipe. Love that smokey flavor you get when you grill eggplant. Babaganoush is one of my all time favorite dips – so yummy and garlicky, and perfect for serving friends and family! Hey, Kylee! You’ll just have to make some for your family and friends. I wish we had some left but our kids took it all. I have heard of baba ghanoush many times and yet did not know it had eggplant. My brother loves eggplant and I think he’d enjoy this. I was the same as you, Val. I’d heard of baba ghanoush many times but had never tasted it. Boy, was I ever missing a real treat!! Are you going to make it for your brother? Love all these ingredients yet i’ve still not made baba ghanoush. It’s on my to make list. Great tip about the salad spinner. Will try this soon. Hello, Gillian! I hope you make the baba ghanoush soon, homemade is so much better, especially on homemade flatbread. 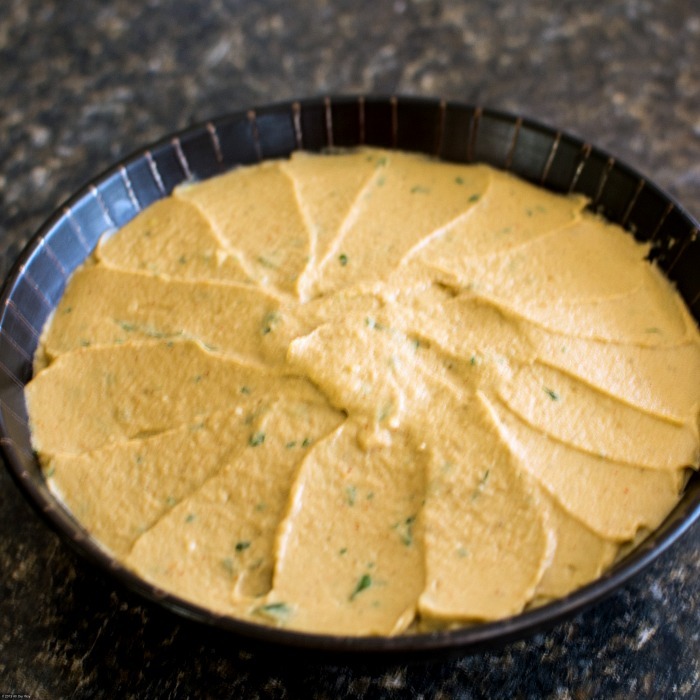 This looks so creamy and delicious:) I love the tastes of tahini, it makes wonderful dip. Love to dig some of it. Hi, Uma! I’m anxious to try more recipes with the tahini — I’ve even seen it with desserts. Hello, Noel! Eggplant tastes so good as a dip! Hope you find some eggplant so you can try it. We make something similar in Indian cuisine called sutta kathirikai chutney. I should try this version sometime. Let me know how you like it and how it compares to your Indian version. I have never roasted them on the grill! Great tip! I am like you in that I want to stop and thank the higher power when I taste something authentic and yummy like that! I felt the same about tzatziki the first time I tasted it! Love this and I’m going to be trying that pocketless pita too! This might be my dinner for a week so no judgment. Hi, Jennifer! I know you’re going to love the roasted eggplant. It’s easy and so good. Try them on the flatbread and I never judge food preferences — I have some of my own. ? This is one of our favorite appetizer dishes – I haven’t made it at home in years though. I’d love to try this one out! You’ll have to make it again, Ashley. Make the homemade flatbread to go along with it. OMG it is soooo good!! Ha! You are so right that it is just fun to say the name of this! 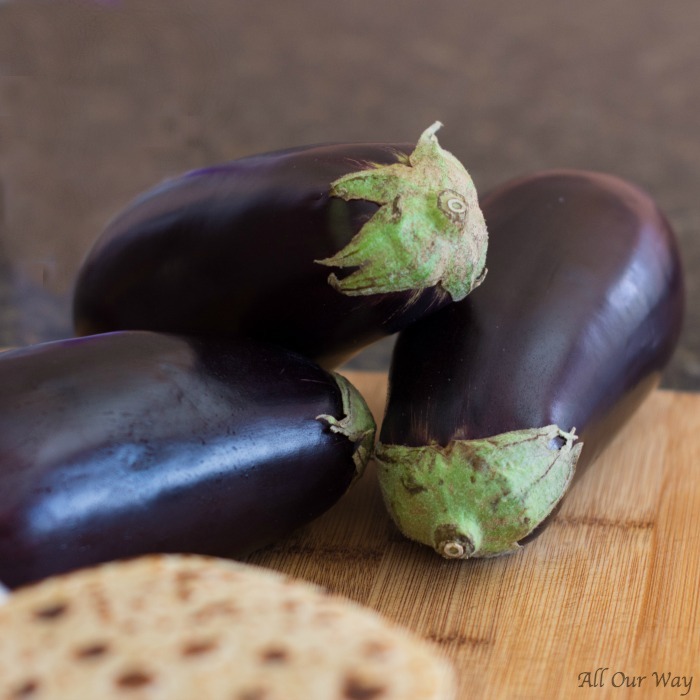 Baba ghanoush is maybe my favorite way of eating eggplant! I absolutely love mediterranean fair and this baba ghanoush looks incredible not to mention that flat bread wow! Thank you, Adriana! They went so well together. I could swish some of the flatbread across the screen into that dip. It looks irresistible. I’m making this for sure. Thanks for all the tips. Ciao, Linda! After all the deliciousness of NOLA this is pretty common! Put I have to admit the dip and flatbread were so good. I really like baba ganoush but I have never made my own. You make it seem so simple! It really is simple, Pam. You’ll have to try to make your own now that grill weather is here. One of my favorite dips. I just love the flavor of the eggplants when they are grilled. I do not see enough people try to make this recipe. Yours looks so creamy. Hi, Peter!! The texture was like butter. The food processor did a great job! And grilling is the best. Oh wow. Marisa. This is such a co-incidence.. I made Eggplant with Tahini today! This looks so good. I love that you pulsed it in the food processor. Looks so smooth. I leave mine chunky. Next time I’m making your recipe. Love the parsley!! Yum. Hey, Veena! Great minds think alike ?. Try it smooth and see how you like it. Let me know — we’ve never had it chunky although, hearing the oohs and aahs from the family I don’t know how it could improve. Such a delicious appetizer/snack. And so good with that homemade pita. Love your recipe. Marisa this sounds amazing, I love dips and I love eggplant, can’t wait to try it. Hi, Rosemary! It can be habit forming. We are making another batch — we hardly got anything from the first one. The kids took it all. ?